When think about Cambodia, the magnificent ancient Angkor Wat (early 12th Century temple) UNESCO world heritage in Siem Reap immediately comes to our mind. Cambodia is a very interesting country, a mixture of Khmer hospitality, Asian exotica, and Indochinese charm. Recently, I had an opportunity to visit Cambodia where I took an educational and history tour. Cambodia is situated in Southeast Asia, shares borders with Vietnam, Laos and Thailand. Land area: 181 035 sq. km Population: 15 million (about 78.4% lives in rural areas). Cambodia was under the French rule from 1863-1953, briefly occupied by Japanese during from 1941 to 1945, flourished in the late 1950 through the 60s, was besieged by the Khmer Rouge in the mid and late 70s, and again revitalized in the 90s and now undergoing rapid change and development. An adventure destination in the 1990s, the country is now a center of diverse economic activities, including tourism. The post-war era in Cambodia has seen some significant changes in the institutional environment. Another characteristic of the post-war era has been the arrival of international donor aid, including both bilateral aid projects and aid from the multilateral institutions from the World Bank, and many international organizations. Cambodia’s economy is projected to grow only seven percent in 2014, slightly down from 2013 (7.2 percent). According to a new report from the Asian Development Bank (ADB), the prospect for economic growth in Cambodia looks brighter for 2015. * Healthcare, education and gender equality. Significant business potentials and scope for participation in the development of these sectors exist. 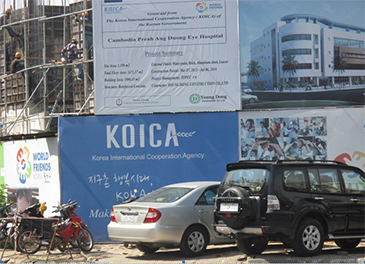 The Korea International Cooperation Agency (KOICA), the Korean government’s overseas aid agency was established on 1st April 1991 to help the least developed countries to carry out projects for social development and strengthening administrative capacities. KOICA Cambodia Office was opened in 2003. KOICA is contributing to the economic and social development of Cambodia. To achieve inclusive development, KOICA is also extending assistance in rural areas, and helping to the enhancement of healthcare services and human resources development in the education sector. KOICA is also helping strengthen the nation’s economic foundation and enhance governance as the backbone for social development. The project aid programs to Cambodia support the construction of schools, hospitals, roads, and other indispensable facilities. •	Project for the Establishment of a Solar Hybrid Power (Micro-Air Turbine) System in the Kingdom of Cambodia.